Plum ‘President’ trees produce an abundance of large, bluish-black fruit with juicy yellow flesh. Although President plum fruit is used primarily for cooking or preserving, it’s also a delight eaten straight off the tree. This vigorous European plum is relatively easy to grow in USDA plant hardiness zones 5 through 8. 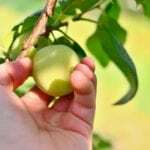 Read on and learn more about this plum tree. President plum trees were bred in Hertfordshire, U.K. in 1901. This sturdy tree tends to be resistant to brown rot, bacterial leaf spot and black knot. Mature size of President plum trees is 10 to 14 feet (3-4 m.), with a spread of 7 to 13 feet (2-4 m.). President plum trees bloom in late March and President plum fruit ripens late in the season, generally mid- to late September. Look for the first harvest two to three years after planting. Growing President plums require a pollinator of a different variety nearby – generally another type of European plum. Also, be sure the tree receives full sunlight for at least six hours per day. President plum trees are adaptable to nearly any well-drained, loamy soil, but they don’t do well in heavy clay. Improve soil drainage and quality by adding a generous amount of compost, shredded leaves, well-rotted manure or other organic material at planting time. If your soil is nutrient-rich, no fertilizer is needed until your plum tree begins bearing fruit. At that point, provide a balanced, all-purpose fertilizer after bud break, but never after July 1. Prune plum President as needed in early spring or mid-summer. Remove water sprouts throughout the season; otherwise, they’ll draw moisture and nutrients from the roots of your President plum tree. Thin plum President fruit in May and June to improve fruit quality and prevent limbs from breaking. Water a newly planted plum tree weekly during the first growing season. Once established, President plum trees require very little supplemental moisture. However, soak the tree deeply every seven to 10 days if you live in an arid climate, or during extended dry periods. Beware of overwatering your President plum tree. 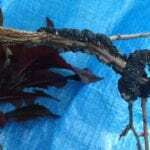 The tree can survive slightly dry conditions, but rot may develop in soggy, waterlogged soil.